This is a shared workspace, no reservations are necessary. Hours are Monday-Thursday from 10am to 10pm, Fridays 10am to 6pm, and Saturdays from 10am to 2pm. The Artist Resource Center is occasionally closed to general use for Dougherty events and classes. Please see below for specific closures. Join our Facebook Group and stay up to date on artist opportunities! 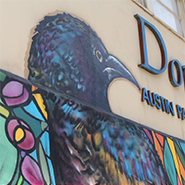 The Dougherty Art Center offers Artist Professional Development through workshops, classes, and residencies. Check out our Artist Professional Development page for information on our classes. Visit our Visual Artist Residency page for information on our residency program. All workshops are free and open to the public. We do appreciate an RSVP to the workshops on our Facebook Events in order to get an idea of how many people to expect. Whether you’re posting on social media or applying for an exhibition, having great photos of your art is essential. Practice taking professional looking photos of your pieces and learn how to make your work stand out. A visual portfolio is a great way to present your work in a concise, organized manner. Learn about the components of a portfolio including a résumé, artist statement, and examples of your work. You’ve made a sale, but there’s one thing you might be forgetting…that pesky sales tax! Learn how to obtain a sales tax permit, calculate sales tax, and file sales tax reports. If you sweat just thinking about “networking,” this is the workshop for you. In this workshop, Ashland Viscosi (Founder of Creatives Meet Business) will share the science behind networks, tips and tricks on maximizing your time at events and in-person opportunities, and how to meaningfully grow your audience. Do you have a great idea for a project? Need some help buying a piece of equipment or building a studio from the ground up? Crowdfunding can be an amazing resource for artists to raise money to get started on the next great thing. Learn the dos and don’ts of running a successful campaign. Are you looking to get to know your local creative community or searching for that perfect collaborative partner for your project? This night of trivia networking is open to artists of all mediums. Bring your business cards and let us play matchmaker! Learn the ins and outs of the online arts application. Exhibitions, festivals, residencies, and many other artistic calls-for-entry are now online. We’ll cover common requirements for completing online applications and walk through the application process for applying to the Dougherty’s Call for Artists for the 2021 gallery season and our Visual Artist Residency Program. Navigating the Health Insurance Marketplace can be a daunting task and as a self-employed artist it’s up to you to make sure you’re covered. Learn about your options and if you’re eligible for free insurance or subsidies. Your career and your health may depend on it. Building and maintaining a career as an artist can be rewarding but overwhelming. Taking the time to take care of yourself will keep you on the right path to success. Learn tips and techniques for keeping your mental and physical health as an artist on track.